Why is BigTracker the best Jungle Scout alternative? As BigTracker is having more recognition in the market now, more and more people ask us to compare it with Jungle Scout. Some Jungle Scout’s customers looking for an alternative are asking us the same question. We would like to give you a clear picture and explain the differences between the two products. JungleScout launched 3 years ago. It’s the leading brand in product research software. Jungle Scout has a free resource sheet and complete tutorial videos.They cover most marketplaces and mainly focus on finding a product niche. launched a few months ago. What separates Bigtracker from the rest is the data accuracy, the product database, and deeper sales analysis. BigTracker mainly focuses on finding a product niche and competitors analysis. BigTracker currently only works for US, UK and JP marketplace, however, DE marketplaces will soon be available in Q1, 2018. Product Research/Database is one of the key factors to measure the data accuracy. The most accurate data analytics needs big sales database to build up the sales model. Apart from basic sales columns and estimated revenue, BigTracker has a profit calculator and a sales graph to evaluate potential products before adding them into the product tracker. Jungle Scout has weight, net. and listing quality search filters which are not available in BigTracker. Jungle Scout uses their algorithm to score products and calculate approx. net. has filters and group settings in advanced search and can easily save your frequently searched criteria as templates. BigTracker is always aiming for the data accuracy, so we don’t give any tag or scores on products. It’s inaccurate because nowadays the market changes daily. What we do instead, is transforming the sales model every 15 days based on collected data which is sufficient and meets the business trends. Jungle Scout provides some basic columns to record sales data in the graph to see daily changes. has more than tracked sales data in the graph. BigTracker can compare sales data of 2 or more different products, set over 20 types of email alerts, and has a special profit calculator which allows backward calculation. 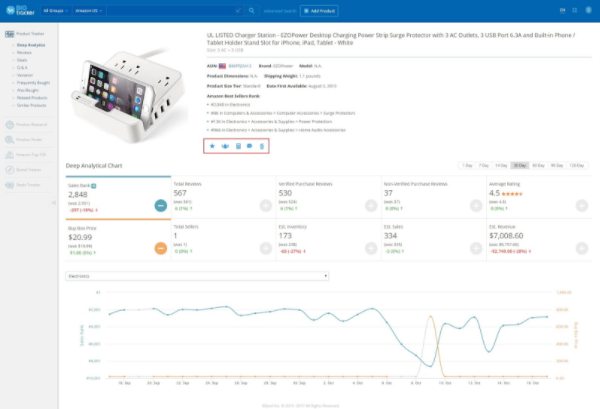 Also, BigTracker tracks all the Q&A, reviews and deals as multiple reference indicators to finding potential products or doing competitors analysis. Niche hunter: For keyword searching. Group settings: 3 tier group settings to help you manage tracked products with different purposes. Email alerts: Over 20 types of email alerts to constantly notify you. Customized your individual alerts can help you save time, react faster, and focus more on selling and your sales strategies. 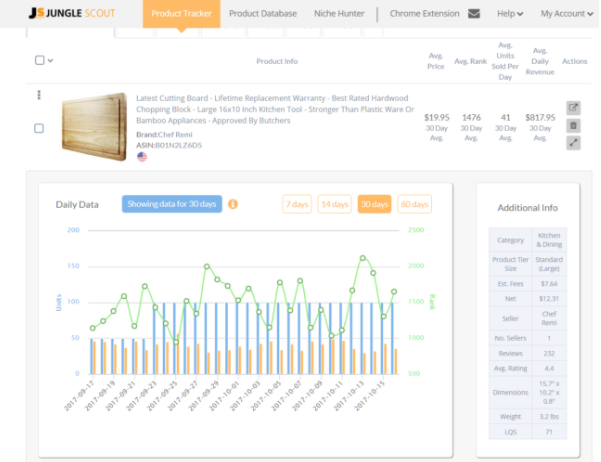 Product comparison: Compare sales data of 2 or more tracked products in sales analytical chart to verify which products have higher potential or conduct the competitor analysis. The sales data can track from 1-120 days depending on the subscription plan. Amazon top 100: Discover the top selling products on Amazon’s page to easily find next hot selling products. Brand tracker: Add yours and your competitor’s brand into brand tracker to scope out of the competition by summarizing brands performance. Deals tracker: You can see exactly what promotions are running by other sellers and take those ideas for yourself. Running promotions is one of the simplest ways to gain product awareness, improve the sales rank, and increase the number of orders and reviews. 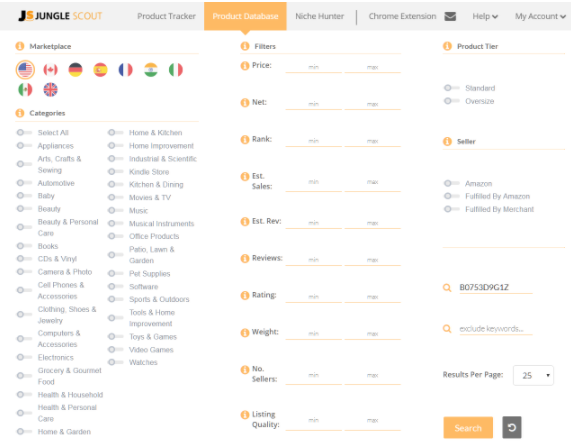 JungleScout current sales column is more suitable for finding potential products. 5 factors prove BigTracker is suitable for finding a product niche and is the best for competitors analysis as well. 1) Deeper analytical chart to compare with other products’ sales performance. 2) Track reviews, deals, and Q&A which help you do the s.w.o.t analysis of your competitors to win the sales opportunity. 3) Track variations to help you find out the best selling child ASIN of each listing. You can stock more of your best selling products and consider to sell your competitors’ best selling products if you don’t have that child ASIN. 4) Brand Tracker: Fully control your brand performance and do the competitors analysis when you want to know your competitors’ product lists and sales performance. 5) Track the latest deals to monitor the market trends and outperform the competitors on Amazon. Even though many product research software differs from one another in terms of its utilities and functionality, data accuracy is often the deciding factor for sellers picking their ideal product research software on the market. Because it’s the core value of all the product research software, it will directly influence the decisions when finding potential products or taking the corresponding sales strategic plans. Jungle Scout model mainly relies on the inventory numbers. When the inventory is over 999, out of stock, limited, or when restocking is happening or when the stock fluctuates in a wide range, that will cause inaccurate estimation of sales and revenue. (2) BigTracker gathers sales data each day to build sales models, and the sales models change every 15 days. That ‘s the key when the inventory fluctuates seriously and we could still keep the data accuracy. (3) The result comes into nonlinear regression, which is called NURBS in engineering mathematics and BigTracker uses our state of art algorithm to analyze it. So, the more days you track, the more accurate data you get. Furthermore, based on our internal testing, Jungle Scout couldn’t estimate precisely if the number of orders is over 6,000 per month. On the contrary, BigTracker can estimate precisely even if the orders number is over 10,000 per month. Please take a look at the screenshot below. The same products in the cell phone and accessories category. This category is one of the most competitive categories on Amazon. Frankly, it is impossible that the estimate sales of this high ranking product are below 6000 per month in such competitive category. We also made a time-saving comparison sheet for your reference. -Track basic data for evaluating product potential. -Track advanced data for evaluating product potential and product performance. -90 days historical data for the standard plan, and up to 120 days depending on the subscription plans. -Millions of untapped products plus accurate estimate sales and revenue. -Monitor competitor promotions and also keep up with the most popular deals trends. -Price, profit, and ROI calculation. -Allow backwards calculation. I hope above comparisons have helped you to find out your ideal product research software. For a whole lot more about BigTracker, please visit our official BigTracker website. Start your 14-day trial and experience the superior BigTracker.